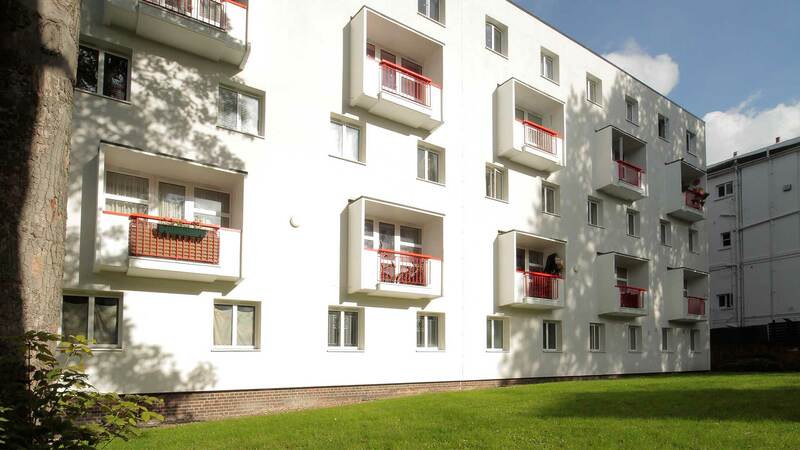 Weber EWI has been specified for the complete thermal upgrade of Kilburn Gate, North London, as part of Camden Council's 'Better Homes' campaign. Substantial reductions in energy costs have been achieved and some residents removed from fuel poverty. Kilburn Gate is a 1950's estate, owned by Camden Council, consisting of three blocks of three and four storey buildings. The 95 homes are occupied by tenants and leaseholders. The construction is of single skin non-cavity brickwork in English bond style. The thermal efficiency of the buildings was inadequate and did not meet the Decent Homes thermal performance standards. Apollo Property Services, now Keepmoat, planned the upgrade project and AK Design Architects, London, provided the detailed drawings. The work included replacement of the existing roof covering and the single glazed fenestration and doors. Additionally the entire outer wall fabric has been rejuvenated with the application of webertherm XM EWI which has dramatically improved the thermal performance of these homes. Calculations prepared by Saint-Gobain Weber identified that the target U-value of 0.3W/m²K could be achieved with the application of webertherm XM using 90mm thick expanded polystyrene (EPS) and render coat. Walkways and balcony areas have been finished with plain render while weberend RB brick-effect render has been applied to areas of original brickwork to help retain the attractive red brick visual treatment that had made the buildings something of a local landmark for more than 50 years. A feature of the building's design includes reinforced concrete detail around window surrounds, balconies and common walkways. Here the concrete penetrates deep into the structure and causes thermal bridging, conducting heat from within the building to escape into the open air. Where possible these elements have been cut back flush with the main wall structure allowing the weberthem XM EWI to operate efficiently over the largest possible wall surface. More than 3000m² of Saint-Gobain Weber EWI has been installed by specialist applicator Primars. 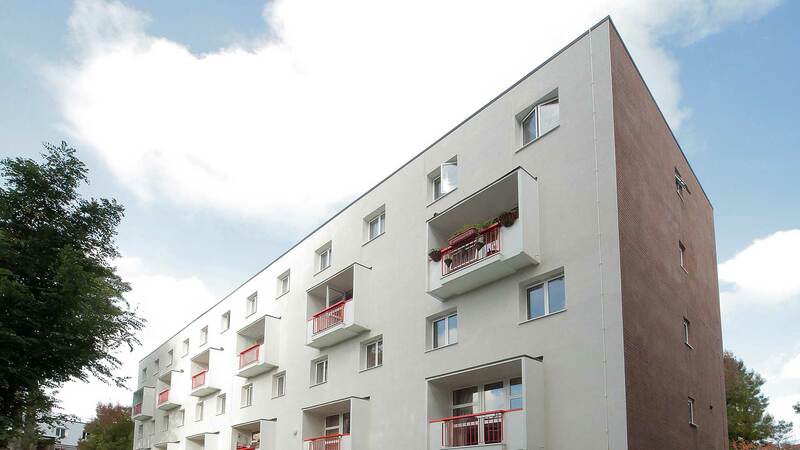 The webertherm XM EWI system with weberend RB achieves striking results. It produces a superb brick effect finish in just a fraction of the time and cost of full brickwork cladding. weberend RB is the combination of two polymer modified mortars used in conjunction to create an authentic brick work pattern. In the webertherm XM EWI system the expanded polystyrene (EPS) is mechanically fixed to the brickwork substrate with meshcloth reinforcement incorporated between two coats of weberend LAC, a polymer modified cement-based mortar. Once set the surface is lightly comb scratched prior to the application of weberend RBB - a base render coat which acts as the 'mortar' joint. When the weberend RBB base coat has taken up and is firm enough to allow application of the face coat, 2-3mm of weberend RBF face coat is applied and stippled with a soft bristle brush to give the brick-effect finish. Six colours of weberend RBF and four colours of weberend RBB are available, allowing clients to replicate almost any brick and mortar combination which is important when matching with existing properties. The brick pattern is achieved by cutting through the weberend RBF face coat to expose the contrasting weberend RBB base render. Often mistaken for high quality bricklaying, any brick bond pattern can be achieved with the system. 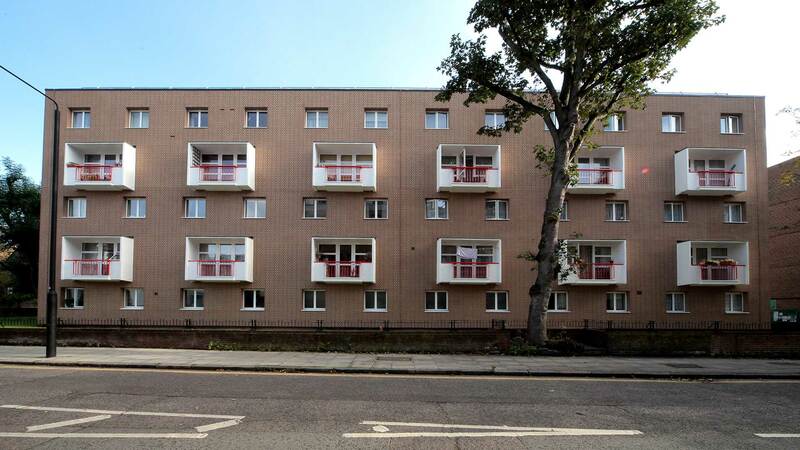 Councillor Julian Fulbrook, Camden Council Cabinet member for Housing, said: "At the start we had a programme to renew the roofs to all four blocks but the cost of erecting scaffolding meant that it was sensible to consider other work that could be done at the same time. The overall budget was around £1.4 million and we qualified for significant external funding through the Community Energy Savings Programme (CESP)" "We estimate that residents will make up to 40% savings in heating costs and that the additional insulation works has removed some residents from the fuel poverty category, which is a very positive result. Residents are complimentary of the much improved comfort levels and the reduction in heating costs, and the buildings look much more attractive in appearance."